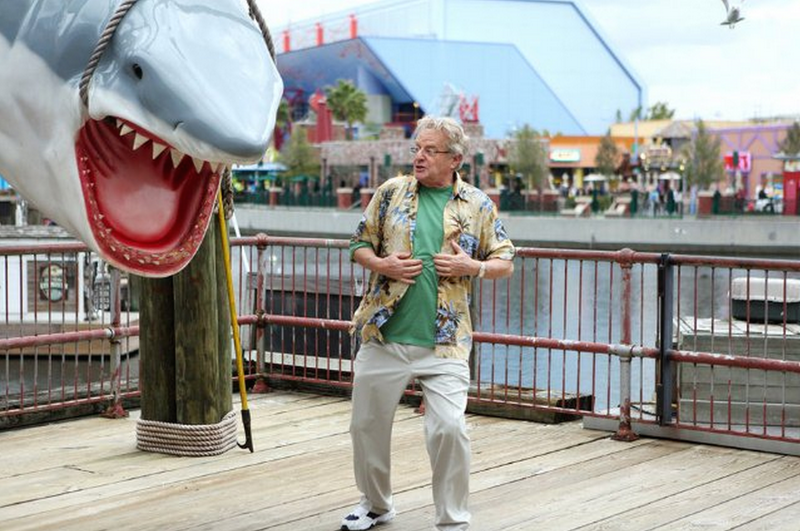 Comcast’s Universal Studios park is the backdrop for Jerry Springer and other Comcast-tied celebs to cash in on what remains of the Sharknado craze. If you’re one of the 1,743 people who are still amused by the whole Sharknado phenomenon, then you should consider yourself warned that the latest entry into the self-consciously trashy TV franchise is apparently not much more than an extended commercial for numerous Comcast-owned brands. AdWeek’s Jason Lynch has an extended rundown of the massive amount of Comcast/NBC Universal product placement in the upcoming Sharknado 3, which airs on Comcast-owned Syfy, but we’ve pulled out the most salient badvertising you’ll be exposed to while enjoying this third adventure with wind-blown predators. • Universal Studios Florida serves as a prominent setting for much of the TV movie, with three different rides featured and a scene set inside the Universal globe at the park. That globe also gets conspicuous placement on the key art for the movie, alongside the White House and a bunch of sharks. • You’ll get to be reminded that Comcast owns the exclamatory E! network, with appearances by multiple personalities from that entertainment-themed cable channel. There are also a number of E! reality show veterans in the movie, like Kendra Wilkinson and Holly Madison. • Let’s not forget about NBC’s flagship morning show. The Today Show’s Matt Lauer and Al Roker reprise their cameos from the second Sharknado, and are joined by Savannah Guthrie, Natalie Morales, Hoda Kotb and Kathie Lee Gifford. • Frequent mentions of the Xfinity brand, and the use of the Xfinity logo on a stock car and several billboards. • Jerry Springer also shows up in Sharknado 3. While it’s not specifically mentioned in the AdWeek story, as we’ve previously noted, his show is distributed by NBC Universal. And this is all in addition to all the product placement paid for by outside advertisers. In a just world, cable subscribers would receive a discount for tuning in to watch two hours of advertising, but instead we live in a world where nearly every frame of a movie can be sponsored and our most celebrated magazine publishers now have entire divisions given over to creating ads that read like genuine editorial content. So bring on the Sharknado. Maybe it’s the TV we deserve.